EPC “Ingehim” (EPC “Inzhekhim”, as in some older unofficial documents and affiliations in scientific publications of our employees) offers service in calculations of processes in apparatuses and plants. Purposes of the works are optimization of technological equipment and determining possibilities of obtaining chemical products of desired quality and quantity. To provide this service, we use modern license software packages (ChemCAD, PetroSIM Express) along with our own in-house codes. Our specialists have vast hands-on experience gained in the past at branch research and design institutes for extensively long periods of time. They hold college degrees in chemical engineering. 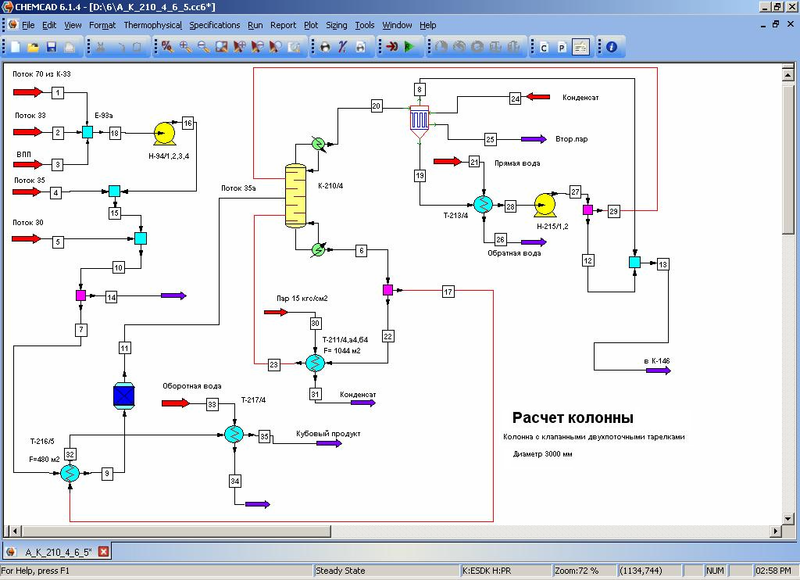 High qualification of our engineers combined with the state-of-the-art software packages (ChemCAD, PetroSIM Express) and modern computers allow us to bring right to your door our high quality service in process calculations. High reliability and accuracy of our calculations has been iteratively noticed by our partners through comparing results of our calculations versus field data for working equipment. EPC “Ingehim” also offers service in performing hydraulic calculations of technological equipment. The purpose of the works is determining the most appropriate types of contact devices at designing new equipment or modernizing already existing equipment.